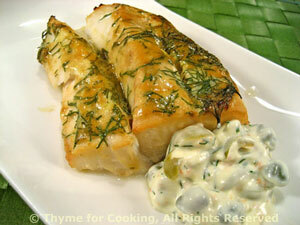 Grilled Cod with Caper Tarter Sauce, Thyme for Cooking easy gourmet recipes. You can use any fish suitable for grilling for this dish. And use the same type of olives in both dishes if you prefer. If you don't have any yogurt lurking in the fridge use all mayo. 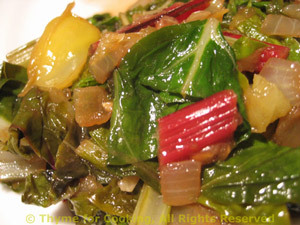 Chard, or Swiss Chard, is a slightly bitter green, reminiscent of spinach. Mine is 'Rainbow Chard', thus all the colors. 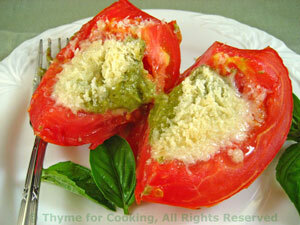 We added some onion, tomato and basil for a summery flavor. We cooked the stems just a bit longer than the leaves - but don't be fussy about it. Stack the leaves together and fold over, the long way. Slice into thin strips, about 1/2" (1cm) using both leaves and stems. Heat oil in a large skillet. Add onion and sauté until tender, about 5 minutes. Add the garlic, chard stems and stir-fry over medium heat 3 minutes. Add the leaves, basil and tomato. Stir and turn until the leaves wilt and it all fits into the skillet. 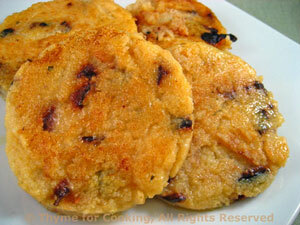 Reduce heat to low and cook until all is tender, another 5 - 6 minutes, stirring frequently.